Posted by bink on September 21 2007, 1:29 AM. Posted in Windows Media. Microsoft’s implementation of HD DVD’s interactivity layer to be promoted on HD DVD hardware and packaging for software. Microsoft Corp. today announced that its trademarked HDi™ logo will soon appear on all Toshiba HD DVD players. In addition, Universal Studios Home Entertainment and Paramount Home Entertainment will include the HDi logo on packaging for HD DVD movie titles beginning in the fourth quarter of this year. HDi technology is Microsoft’s high-performance implementation of the interactivity layer for the HD DVD format, which has taken the movie-viewing experience to an entirely new level with such advanced features as network connectivity and community scenarios. HDi is also a trademark of Microsoft, as recognized by the United States Patent and Trademark Office in its July 2007 notice of allowance for trademark. As Microsoft’s implementation of the mandatory interactive layer in HD DVD, defined as Advanced Navigation by the DVD Forum, HDi immediately began delivering unprecedented and unique experiences for consumers when it was launched in April 2006. Early movie titles such as “The Fast and the Furious: Tokyo Drift,” “Miami Vice” and “Mission: Impossible III” received immediate acclaim for their interactive HD DVD experiences — from picture-in-picture director’s commentary to graphical interfaces with tailored movie specifications — all available without stopping the movie playback experience. Based on easy-to-program Web standards, HDi provides studios with a familiar and simple development environment, resulting in a digital canvas of unlimited possibilities. With support for interactivity mandatory on all HD DVD players, HDi allows for advanced features that can be played back on any HD DVD player or drive. “For studios to truly enhance and change the way people watch movies, HD DVD provides the features and the flexibility we need to offer a personalized experience,” said Ken Graffeo, executive vice president of Universal Studios Home Entertainment and co-president of the North American HD DVD Promotional Group. “Web-enabled network features made possible through HDi are particularly compelling because they bridge the gap between physical media and the Web-based world of the MySpace generation.”Studios supporting HD DVD are already delivering on promises of expanding their offerings with Web-enabled network (interactive) features on shipping titles such as “300” and “Blood Diamond” from Warner Bros., “Heroes: Season 1” from Universal and the upcoming “Transformers” from Paramount. The ability to download new trailers, buy ring tones and other merchandise, and share favorite bookmarked scenes with other HD DVD owners are just a few of the features now available on discs from studios supporting HD DVD. Universal recently announced that all day-and-date titles moving forward will include Web-enabled network features powered by HDi. Microsoft HDi technology powers the interactive capabilities in every stand-alone HD DVD player on the market as well the HD DVD drive for Xbox 360®. More information about HDi can be found at http://www.thisishddvd.com/. Posted by bink on September 7 2007, 3:05 PM. Posted in Windows Media. Italian broadcaster RAI to join early adopter program; new partners help expand capabilities to help simplify user experience and better utilize existing technology investments within the workflow process. Today at IBC2007, Microsoft Corp. announced a new early adopter customer and an expanded partner ecosystem for Microsoft® Interactive Media Manager (IMM). Italian broadcaster RAI has joined the Technology Adoption Program for IMM, which will enable RAI to manage the media workflow process as it digitizes assets for viewing over the Web through a variety of screens and devices. In addition, Microsoft is making an expanded set of capabilities available to media companies in conjunction with IMM. To deliver these capabilities, Microsoft has forged relationships with independent software vendors (ISVs) including FileCatalyst, Marquis Broadcast Ltd., Rhozet and TeleStream Inc., and system integrators (SIs) such as Accenture, Ascentium Corp., The Computer Merchant Ltd., Intellinet Corp., SpeakTECH and Tata Consultancy Services Ltd.
RAI will use IMM as a media management solution for digitizing assets from tape and MXF files and outputting the digitized files into a storage area network. IMM provides RAI with the ability to search and browse assets after they have been ingested, a mechanism for streamlining the review and approval process and reporting functionality. New and expanded features enabled through these alliances, such as fast and efficient file transfer, real-time media encoding and edit decision list (EDL)/sequence transfer, will help improve and simplify the user experience and allow media companies to easily utilize existing technology investments within the workflow process. The new offerings, from many of the leading companies in the media and entertainment industry, demonstrate the important role that IMM provides as a central hub for the media workflow process and platform. Posted by bink on September 7 2007, 3:03 PM. Posted in Windows Media. Adopting Microsoft technologies and solutions helps media and entertainment organizations simplify the digital content life cycle. AMSTERDAM, Netherlands — Sept. 7, 2007 — This week at IBC2007, Microsoft Corp. is announcing new customers, partners and programs that further underscore the value Microsoft provides to organizations in the media and entertainment industry. Through its broad range of solutions, Microsoft enables media and entertainment companies to create and manage nearly endless varieties of media and deliver stunning entertainment experiences to their customers. Microsoft is highlighting updates, including new customers and partners, for two solutions launched in April at NAB2007: Microsoft® Silverlight™ and Microsoft Interactive Media Manager (IMM). In addition, Microsoft is detailing new customer and partner adoption of the Microsoft VC-1 Encoder software developer kit (SDK) and is announcing the Microsoft Mediaroom™ Interoperability and Qualification Lab (IQ Lab) for digital video encoders. Microsoft is also outlining collaborative efforts with KT Corp. and SBSi, a subsidiary of SBS Media Group, to create a digital content and syndication hub for suppliers and distributors of content. Microsoft continues to develop the foundational technologies that help media companies create rich media content easily, quickly and cost-effectively. At IBC2007, Microsoft is announcing broad industry support for the Microsoft VC-1 Encoder SDK, a commercial offering first announced in April. Leading product vendors are taking advantage of the substantial quality and performance improvements delivered through the new technology and are building next-generation products that efficiently produce exceptional video imagery for a variety of distribution and consumption scenarios. Consequently, major content providers, recognizing the benefits of faster encoding and the value of delivering best-of-breed video quality to their customers, are also adopting the new VC-1 Encoder technology through these new tools. In the broadband and mobile content distribution segments, Red Bee Media Ltd. has chosen tools based on the VC-1 Encoder from Anystream Inc. to rapidly repurpose and streamline the delivery of high-quality, bandwidth-efficient video content for the BBC’s innovative new iPlayer service. Posted by bink on August 30 2007, 8:11 PM. Posted in Windows Media. Stephen Coy , the designer of the Windows Vista screensavers and Tim Cowley, a software engineer on the Office team have come together to release a visualizations pack for Windows Media Player called “Psychedelia” two years in the making. But don’t worry, no LSD drugs involved. Posted by bink on August 6 2007, 3:43 PM. Posted in Windows Media. Collaboration to make it easy for content owners and service providers to offer content with more flexibility. Building on their existing collaboration around mobile entertainment, Nokia and Microsoft Corp. have extended their cooperation to include support for Microsoft® PlayReady™ technology into the Nokia S60 and Series 40 mobile device platforms. PlayReady is a new content access technology from Microsoft that makes it easy for content owners and service providers to deliver virtually any type of digital content in a flexible manner. As part of the agreement, Nokia and Microsoft will also collaborate on expanding and simplifying consumer scenarios for accessing, experiencing and moving digital content using mobile devices. By supporting PlayReady, Nokia will make it easier for content owners and service providers to offer premium digital content for a radically increased installed base and enable more flexible business models, such as renting content or accessing it offline. For consumers, PlayReady brings flexible ways to manage their digital content between online, home and mobile devices. For example, a consumer could purchase content directly from their Nokia device and then transfer the content to enjoy on other designated devices, such as PCs or mobile devices. Microsoft PlayReady is designed for digital entertainment services, devices and applications, with a specific focus on meeting the needs of mobile operators, service providers and device manufacturers. The technology supports a range of business models that can be applied to almost any type of digital content (music, video, games, ringtones, images and more) and a wide range of audio and video formats (including Windows Media® Audio (WMA), Windows Media Video (WMV), AAC, AAC+ and H.264). Microsoft released the PlayReady Client Porting Kit for mobile devices in early August 2007, and expects the first services using Microsoft PlayReady technology to appear in 2008. In addition, Microsoft has designed PlayReady to be fully backward-compatible with Windows Media DRM 10, which means that devices supporting PlayReady can access existing Windows Media DRM-based content as well as new PlayReady content services. Posted by bink on June 27 2007, 1:56 PM. Posted in Windows Media. "The BBC has chosen Microsoft's DRM technology to limit the viewing of content downloaded from their website. These downloads would allow viewers to catch up on shows that were broadcast on the previous 7 days; they would be compatible only with Windows Media Player and a new product called 'iPlayer'. This iPlayer is not yet available for platforms other than MS Windows, which caused the Open Source Consortium (OSC) to file a complaint to national and EU authorities. 'The BBC aims to make its content as widely available as possible and has always taken a platform agnostic approach to its internet services. It is not possible to put an exact timeframe on when BBC iPlayer will be available for Mac users. However, we are working to ensure this happens as soon as possible and the BBC Trust will be monitoring progress on a six monthly basis.'" Posted by spy on April 18 2007, 3:26 PM. Posted in Windows Media. Posted by bink on April 9 2007, 11:57 PM. Posted in Windows Media. Lost amid the hoopla over last week's EMI announcement regarding their decision to sell digital music without digital rights management (DRM) restrictions was the fact that Apple was only the first digital music reseller to sign on for the new offerings. This week, Microsoft admitted that it, too, would offer music without DRM. "The EMI announcement is not exclusive to Apple," a Microsoft spokesperson says. "Consumers have made it clear that unprotected music is something they want. We plan on offering it to them as soon as our label partners are comfortable with it." Microsoft says it has been working with EMI and other record labels for quite some time, and will offer DRM-free music via the Zune Marketplace, its online service for the Zune portable device, as soon as possible. Posted by spy on January 16 2007, 12:42 PM. Posted in Windows Media. <basefont /> Windows Media Player 11 offers great new ways to store and enjoy all of your digital media. It's easier than ever to access all of your music, video, pictures, and recorded TV on your computer. Play it, view it, organize it, and sync it to a portable device for enjoying on the go, or share with devices around your home - all from one place. 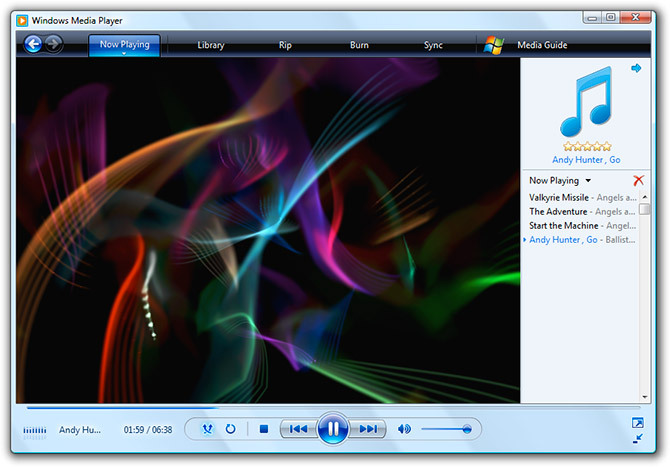 Windows Media Player 11 is designed to work with all versions of Windows XP with Service Pack 2, including Windows XP Home Edition N and Windows XP Professional N. Download At SourceEdit: I don't know what is different, however this release is dated 15th January 2007. Perhaps someone can post a comment if they know the differences. Posted by bink on December 20 2006, 5:36 AM. Posted in Windows Media. Posted by bink on December 11 2006, 7:02 PM. Posted in Windows Media.